The GDC DNA-Seq analysis pipeline identifies somatic variants within whole exome sequencing (WXS) and whole genome sequencing (WGS) data. Somatic variants are identified by comparing allele frequencies in normal and tumor sample alignments, annotating each mutation, and aggregating mutations from multiple cases into one project file. The first pipeline starts with a reference alignment step followed by co-cleaning to increase the alignment quality. Four different variant calling pipelines are then implemented separately to identify somatic mutations. Somatic-caller-identified variants are then annotated. An aggregation pipeline incorporates variants from all cases in one project into a MAF file for each pipeline. 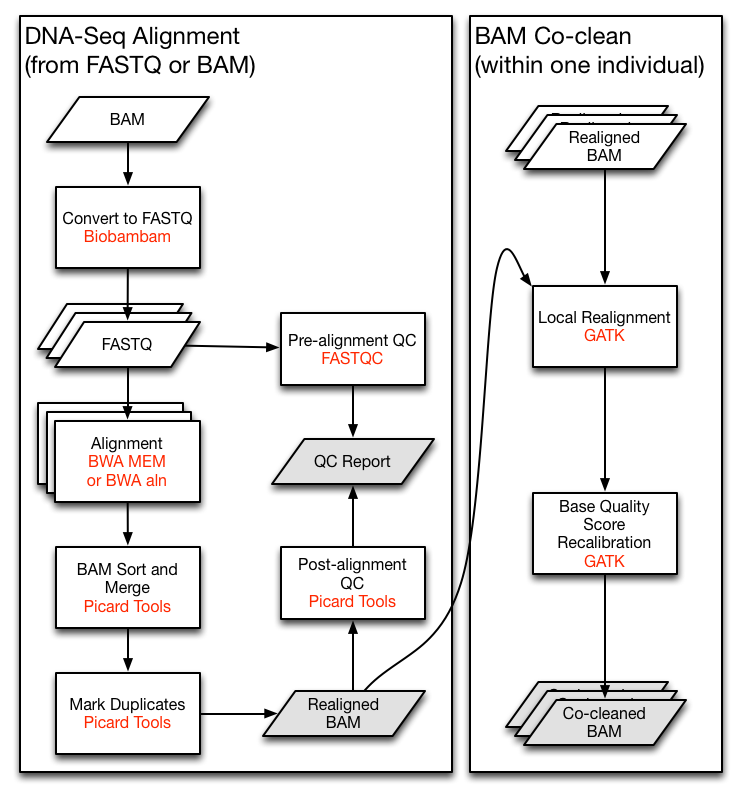 Prior to alignment, BAM files that were submitted to the GDC are split by read groups and converted to FASTQ format. Reads that failed the Illumina chastity test are removed. Note that this filtering step is distinct from trimming reads using base quality scores. DNA-Seq analysis begins with the Alignment Workflow. Read groups are aligned to the reference genome using one of two BWA algorithms . BWA-MEM is used if mean read length is greater than or equal to 70 bp. Otherwise BWA-aln is used. Each read group is aligned to the reference genome separately and all read group alignments that belong to a single aliquot are merged using Picard Tools SortSam and MergeSamFiles. Duplicate reads, which may persist as PCR artifacts, are then flagged to prevent downstream variant call errors. Quality control metrics are collected before and after the alignment workflow and reviewed to identify potential low-quality data files. Basic metrics such as GC content and mean read length as well as quality score metrics are collected from unaligned reads using FASTQC. Quality metrics collected by the GDC for aligned reads include samtools idxstat and flagstat. Alignment information is collected using Picard CollectMultipleMetrics for both WGS and WXS. Coverage information is collected using picard CollectWgsMetrics for WGS and picard CollectHsMetrics for WXS. Quality control metrics for each file endpoint can be accessed through the API using the expand=analysis.metadata.read_groups,analysis.metadata.read_groups.read_group_qcs parameter. Click here for an example query. All alignments are performed using the human reference genome GRCh38.d1.vd1. Decoy viral sequences are included in the reference genome to prevent reads from aligning erroneously and attract reads from viruses known to be present in human samples. Ten types of human viral genomes are included: human cytomegalovirus (CMV), Epstein-Barr virus (EBV), hepatitis B (HBV), hepatitis C (HCV), human immunodeficiency virus (HIV), human herpes virus 8 (HHV-8), human T-lymphotropic virus 1 (HTLV-1), Merkel cell polyomavirus (MCV), Simian vacuolating virus 40 (SV40), and human papillomavirus (HPV). Reference sequences used by the GDC can be downloaded here. Note that version numbers may vary in files downloaded from the GDC Portal due to ongoing pipeline development and improvement. If the quality scores are encoded as Illumina 1.3 or 1.5, use BWA aln with the "-l" flag. The alignment quality is further improved by the Co-cleaning workflow. Co-cleaning is performed as a separate pipeline as it uses multiple BAM files (i.e. the tumor BAM and normal tissue BAM) associated with the same patient. Both steps of this process are implemented using GATK. Local realignment of insertions and deletions is performed using IndelRealigner. This step locates regions that contain misalignments across BAM files, which can often be caused by insertion-deletion (indel) mutations with respect to the reference genome. Misalignment of indel mutations, which can often be erroneously scored as substitutions, reduces the accuracy of downstream variant calling steps. A base quality score recalibration (BQSR) step is then performed using BaseRecalibrator. This step adjusts base quality scores based on detectable and systematic errors. This step also increases the accuracy of downstream variant calling algorithms. Note that the original quality scores are kept in the OQ field of co-cleaned BAM files. These scores should be used if conversion of BAM files to FASTQ format is desired. Variant calls are reported by each pipeline in a VCF formatted file. See the GDC VCF Format documentation for details on each available field. At this point in the DNA-Seq pipeline, all downstream analyses are branched into four separate paths that correspond to their respective variant calling pipeline. Four separate variant calling pipelines are implemented for GDC data harmonization. There is currently no scientific consensus on the best variant calling pipeline so the investigator is responsible for choosing the pipeline(s) most appropriate for the data. Some details about the pipelines are indicated below. The MuTect2 pipeline employs a "Panel of Normals" to identify additional germline mutations. This panel is generated using TCGA blood normal genomes from thousands of individuals that were curated and confidently assessed to be cancer-free. This method allows for a higher level of confidence to be assigned to somatic variants that were called by the MuTect2 pipeline. Indel mutations that were generated with the MuTect2 and VarScan pipeline are detected and reported in GDC VCF files. At this time, germline variants are deliberately excluded as harmonized data. The GDC does not recommend using germline variants that were previously detected and stored in the Legacy Archive as they do not meet the GDC criteria for high-quality data. Note: -E is used for WXS data and -G can be used for WGS data. Raw VCF files are then annotated in the Somatic Annotation Workflow with the Variant Effect Predictor (VEP) v84  along with VEP GDC plugins. Due to licensing constraints COSMIC is not utilized for annotation in the GDC VEP workflow. In addition to annotation, False Positive Filter is used to label low quality variants in VarScan and SomaticSniper outputs. Variants with SSQ < 25 in SomaticSniper are also removed. Tumor only variant calling is performed on a tumor sample with no paired normal at the request of the research group. This method takes advantage of the normal cell contamination that is present in most tumor samples. These calls are made using the version of MuTect2 included in GATK4. Tumor-only variant call files can be found in the GDC Portal by filtering for "Workflow Type: GATK4 MuTect2". ## After this step, all chromosome level VCFs are merged into one. After single-tumor variant calling is performed with MuTect2, a series of filters are applied to minimize the release of germline variants in downloadable VCFs. In all cases, the GDC applies a set of custom filters based on allele frequency, mapping quality, somatic/germline probability, and copy number. In some cases an additional variant classification step is applied before the GDC filters. Interval Capture : Generates an interval file using a FASTA and BED file coordinates. GC-Normalization : Calculates GC-normalized tumor/normal coverage data. Note that PureCN will not be performed if there is insufficient data to produce a target capture kit specific normal database. In rare occasions, PureCN may not find a numeric solution. If PureCN is not performed or does not find a solution, this is indicated in the VCF header. VCF files that were annotated with these pipelines can be found in the GDC Portal by filtering for "Workflow Type: GATK4 MuTect2 Annotation". The Somatic Aggregation Workflow generates one MAF file from multiple VCF files; see the GDC MAF Format guide for details on file structure. In this step, one MAF file is generated per variant calling pipeline for each project and contains all available cases within this project. The MAF files generated by Somatic Aggregation Workflow are controlled-access due to the presence of germline mutations. Open-access MAF files are modified for public release by removing columns and variants that could potentially contain germline mutation information. See the GDC MAF Format for details about the criteria used to remove variants. While these criteria cause the pipeline to over-filter some of the true positive somatic variants in open-access MAF files, they prevent personally identifiable germline mutation information from becoming publicly available. The GDC recommends that investigators explore both controlled and open-access MAF files if omission of certain somatic mutations is a concern. Files from the GDC DNA-Seq analysis pipeline are available in the GDC Data Portal in BAM, VCF, and MAF formats. Descriptions are listed below for all available data types and their respective file formats.
. Li, Heng, and Richard Durbin. "Fast and accurate short read alignment with Burrows-Wheeler transform." Bioinformatics 25, no. 14 (2009): 1754-1760.
. Fan, Yu, Liu Xi, Daniel ST Hughes, Jianjun Zhang, Jianhua Zhang, P. Andrew Futreal, David A. Wheeler, and Wenyi Wang. "Accounting for tumor heterogeneity using a sample-specific error model improves sensitivity and specificity in mutation calling for sequencing data." bioRxiv (2016): 055467.
. Cibulskis, Kristian, Michael S. Lawrence, Scott L. Carter, Andrey Sivachenko, David Jaffe, Carrie Sougnez, Stacey Gabriel, Matthew Meyerson, Eric S. Lander, and Gad Getz. "Sensitive detection of somatic point mutations in impure and heterogeneous cancer samples." Nature biotechnology 31, no. 3 (2013): 213-219.
. Koboldt, Daniel C., Qunyuan Zhang, David E. Larson, Dong Shen, Michael D. McLellan, Ling Lin, Christopher A. Miller, Elaine R. Mardis, Li Ding, and Richard K. Wilson. "VarScan 2: somatic mutation and copy number alteration discovery in cancer by exome sequencing." Genome research 22, no. 3 (2012): 568-576.
. Larson, David E., Christopher C. Harris, Ken Chen, Daniel C. Koboldt, Travis E. Abbott, David J. Dooling, Timothy J. Ley, Elaine R. Mardis, Richard K. Wilson, and Li Ding. "SomaticSniper: identification of somatic point mutations in whole genome sequencing data." Bioinformatics 28, no. 3 (2012): 311-317. McLaren, William, Bethan Pritchard, Daniel Rios, Yuan Chen, Paul Flicek, and Fiona Cunningham. "Deriving the consequences of genomic variants with the Ensembl API and SNP Effect Predictor." Bioinformatics 26, no. 16 (2010): 2069-2070. Riester, Markus, Angad P. Singh, A. Rose Brannon, Kun Yu, Catarina D. Campbell, Derek Y. Chiang, and Michael P. Morrissey. "PureCN: copy number calling and SNV classification using targeted short read sequencing." Source code for biology and medicine 11, no. 1 (2016): 13.